Few people could have imagined how much the internet would transform our activities. Probably not even Robert Kahn and Vincent Cerf, the guys who invented the internet. One area that has seen the most change is the way we work. It didn’t take long for people to realize that they didn’t need to meet in an office to discuss a client, or share a file; it could all be done through the internet. A few months after I got my bachelor’s degree, I started working. From that time till today, I’ve had the pleasure of working with a number of teams, but I’ve never stepped in an office. I’m either at home or in a beautiful city mall with my laptop and internet dongle. And yes, remote work is just as great as people describe it. Nowadays, it’s not hard to see a company that has a team of 10 people, who are spread across every continent on the earth. Even companies that have all their workers living within a city (or country) now give the option for people to work from home. Yahoo is one such company, but if you have been following the news, you may be aware that in 2013, the CEO tried to end remote work for all employees. Apparently, she wasn’t completely successful, and frankly, it’ll have been quite a surprise if she was. Many other companies are heavily dependent on remote workers, and the stats favor this choice. A blog post in the Harvard Business Review website shows that remote workers are actually more productive that in-office workers. These stats make sense when you consider it takes a motivated self-starter to be able to work remotely in the first place. This blog post highlights these challenges, why they exist, and how to deal with them. Effective communication is important in all settings. For a remote team however, it is “communicate effectively, or close up shop.” Getting people in different locations to achieve a common goal takes being able to master remote communication. Thankfully, the internet has provided many powerful tools that can make this easy. The key is to take advantage of these tools in harmony with some best practices. For example, for a team to work effectively together, they need to communicate at least once each day. Even when tasks have been assigned, it makes sense to get the team together via Skype, Gotomeeting, or a similar tool. In these sessions, team members can update others on their progress, challenges encountered, skills learnt in the course of performing duties, etc. Here’s a power tip you should try: At the start of each workday (say by 9am) get team members together via a conference session. After discussing major issues, encourage team members to remain connected to the line for one more hour. If anyone has any question, or a suggestion for the team, they simply unmute, speak up, and continue communicating. One of the most important steps in managing a remote team is choosing the right people in the first place. The truth is, not everyone can work effectively from a remote location. If a person needs much assistance to get the job done, chances are that person is more suitable for an in-office position. When looking for remote team members, find people who can demonstrate (or have demonstrated) their ability to manage time, handle tasks, and deliver results. These people should also be highly motivated. A good way to recruit suitable people is to hire on trial basis. Within the trial period, you can assess the person’s work and determine if they are a good fit for your team. You get the point. Within an office, it is sometimes hard to keep track of activities. It is even more difficult in a remote setting. For a remote team to function together, each team member needs to know exactly what other team members are working on, how much progress they have made, and if and when their attention may be needed as part of another team member’s activities. It is best to take advantage of collaboration tools like Trello and Slack, to help keep people on top of activities, and in fact, you may need to use both tools. Here’s why. Trello is a tool for assigning tasks and keeping track of activities, and it does that very well. Slack on the other hand focuses on team communication about activities, and it offers many powerful features and integrations to make this process effective. Most people who have used both tools conclude that you are better off using the two together. However you can start with one (preferably Trello), and include the other later on. In an office setting where there are departments and managers and the like, it may be fine for employees to know just what their jobs are and how to get them done. Understanding how it all fits into the goals of the company is more a job for managers and executives. In most remote settings however, employees often have to wear different hats and manage themselves. Thus, you are much better off keeping team members keenly aware of the company’s short term, and even long term goals. When employees are kept in the know like this, they are able to contribute their ideas and creativity to seeing these goals attained, and if you have worked in a remote team, you know how important this is. Also, when goals are met, inform employees of this and explain how the team made it happen, and what new goals you have set if any. Consider this: A team member in the US (CST) says to another in the Philippines, “Let’s get together to discuss this by Tuesday 4PM.” If indeed this conversation takes place, although it happened on Tuesday for the person in the US, it actually happened on Wednesday for the team member in the Philippines (yes telecommuting is time travel). In a remote team I work with, we usually have to get together by 9am CST. At this time, it is already evening for some team members, while others are well into the night. So in exchanging pleasantries, hi, good morning, is quickly followed by hello, good evening to others. The importance of knowing time zones however goes far beyond pleasantries. It helps you determine when will be the best time for a meeting, or for performing certain tasks. For tasks that are not time bound, it is best to allow employees perform them within daylight hours in their time zone. Many remote teams allow for wiggle room in this manner, and this leads to productivity. When you get together to discuss, what do you talk about? Goals, activities, customers? Yes, that should majorly be what you discuss, but not ALL you discuss! Remember, humans are social beings, and beyond knowing about work, we also usually want to know our team members and keep updated on the happenings in their lives. I’ve been fortunate to work in teams that value social interactions, and I can tell you, being very social does not reduce work output. Quite contrarily, it keeps employees engaged, happy, and productive. So the next time you have a group meeting, ask employees about their personal lives (if you have not been doing this), or better yet, start off by telling them something about yours. If you’ve found a special recipe that you really like, or a place you plan to spend your holiday, share it with team members and have them discuss. To build a strong remote team, you need friends, not minions. How Can You Apply This To Your Remote Team? Very likely, you have already been using some of the tips shared in this post. So you can look for areas addressed here in which you are not doing so well. Do you communicate regularly, but only about business? Spice it up with some social chat. Do you make all the plans and only tell team members what they need to do? Then you may be wasting valuable brain power that could move your business from A to B. 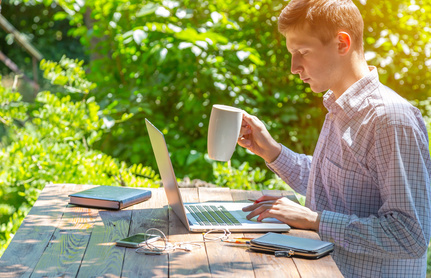 The truth is, telecommuting is here to stay! The stats even reveal that more and more people will be working remotely in upcoming days. Although there are some challenges in managing remote teams, these challenges hide under the mat when the advantages pay a visit. Better yet, these challenges can largely be conquered with a little effort.